Are you Still searching for a Dynamo node to create powerful custom nodes that extend the functionality of Dynamo and solve your Revit modeling challenges in smarter and faster ways? Python scripting can help you!! #MCTCDubai introduces #Revit #Dynamo with #Python #Scripting #course #first in #Dubai.. 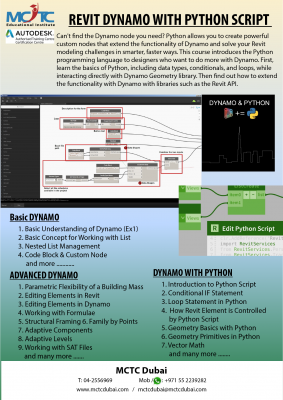 This course introduces python programming language to designers who want to do more with Dynamo. First, we will teach you the basics of python including datatypes, conditions and loops while interacting with Dynamo Geometry library. The next step is how to extend the functionality in Dynamo with libraries such as Revit API. Our course will cover basic Dynamo, Advanced dynamo and Dynamo with Python. We have proven years of experience in all Autodesk and Engineering Courses since 2006. Register with us and start learning from our experts to be competitive in Industry!! If you are new to Dynamo, call 0552239282 / 042970083 / 042556969 know more and get a #free #demo #session! !